What is Fluorocarbon Fishing Line? Elasticity: It is all about Science! All we fishers who respect and love our amazing hobby try to improve our success rates by renewing our equipment. 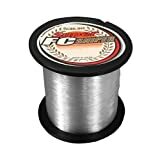 The fishing line is an essential part of our fishing tackle because it is the only connection between you and the fish. Since you are reading our article, you already know that there are many fishing line types. Fluorocarbon fishing line is one type of line used for many fishing circumstances, and it has some special characteristics. These characteristics make the line unique and very useful. Unfortunately, many anglers do not know what exactly a fluorocarbon line is. Thus, they cannot choose the right one when it comes to fluorocarbon. We hear all the time the same questions: What is a fluorocarbon? Why is it more expensive than common monofilament line? What makes it special? Consequently, we decided to analyze the special characteristics and features of fluorocarbon line. Afterward, we reviewed the five best products which we think that are suitable for you. We, by bravehunters.com, promise that you will find the best fluorocarbon fishing line that will meet your demanding fishing expectations. Hundreds of years ago, fishing was very easy for everyone due to a large amount of fish. There were 25 times more fish in the seas, lakes, and rivers all over the world. There was no over fishery or environment pollution. Unfortunately, today most waters are running out of fish. Furthermore, through the passage of time, fish became more suspicious. A simple rig and bait are not enough to attract them. If they notice that the bait is fake or if they see the line, they will swim away and never come back. Thus, «invisible» line was born! In 1960, manufacturers launched the first fluorocarbon lines. This line «disappears» in the water and fish cannot see it. The main construction material of fluorocarbon is PVDF (polyvinylidene fluoride). Scientifically, it is a thermoplastic fluoropolymer used for many purposes. We use fluorocarbon line for the leader line because it is closer to the bait-lure. It goes without saying that you can use it as the main line if you want to load your spinning or baitcasting reel. However, it is slightly more expensive than monofilament line. Undoubtedly, the main outstanding characteristic of fluoro line is low visibility. Keep in mind that it is not completely invisible in the water. Many Companies claim that their lines are 100% invisible, but it is not true. Thus, you should be more careful before buying any line. Scientifically, fluorocarbon has I higher refraction index than monofilament line due to the density of the material. Fluoroline absorbs the sun rays so fish cannot see it. It goes without saying that this factor increases your success rates, especially if you fish for predators with sharp eyes. They are suitable both for murky and crystal clear waters. Additionally, this line has many other features, and most manufacturers do not advertise them. You should not overlook any characteristic because they will play a decisive role when it comes to best fluorocarbon line selection. Fluorocarbon line is well-known for its low elasticity levels. As a matter of fact, the mono line stretches more than fluoro. Generally speaking, this ability refers to elasticity and plasticity. Elasticity is different than plasticity. Elasticity: If an exterior stress «touches» an item, the item is deformed, but this deformation is reversible. Plasticity: In that case, the deformation is not reversible. Fluoro line has low elasticity levels but if there is much stress applied for a long period the deformation will be not reversible (plastic deformation). Undoubtedly, if you store the line on a reel for many years in your basement, it will be ruined. This factor is very useful as you feel the fish bites immediately so you can act quickly. Moreover, fluorocarbon, due to its chemical structure, is 1.7 denser than nylon and the water absorption levels are 0.04%. Water density is 1. The final verdict? It sinks faster than monofilament line (You will notice this if you use topwater lures. This means that the characteristics remain unchanged (hardness, elasticity, and strength). Of course, this factor extends the lifespan of your line and offers many benefits for every angler. If you want to get a good line, it must be strong, especially if you are after big fish with sharp teeth. Another advantage of fluoro line is that it is abrasion resistant. This helps you not only with the knot, but also if you are fishing in waters with rocky bottoms. There is no doubt that they come in different sizes and diameters. It does not play an important role, but that depends on the fish species you are fishing for. Fluoro line diameters start from 0.14mm up to 0.90mm. It would be a good idea to use thin lines as leader lines. So you are tired of looking for the best fluoro line which will fulfill your expectations. 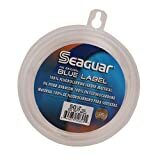 Here comes the Seaguar Blue Label line which is suitable for all fishing techniques and tactics. You will get all the advantages of a good fluorine at a low price. Sensitivity: This stiff line is made for you. If you want to feel even the weakest bites, you should give it a try. It is a top choice of many anglers all over the US. The low elasticity level of the line makes it very sensitive. Quick sinking: This is a feature that you should take into consideration. Especially, if you are a topwater lure enthusiast! Spinning with topwater lures requires fast action. If the lure sinks faster, you can increase the casts per minute. DSF Line: This means double structure fluorocarbon. Stiffer Knots and abrasion resistance. 100% Fluorocarbon: If you take a closer look at the package you will see that it is 100% fluorocarbon. Most fluoro lines are just fluoro coated. This line is not. Thus, fish will not notice the line. Undoubtedly, it is considered to be a great value fluorocarbon line. Many people use it, and they are satisfied. The only downfall is the price, but there is no problem if you want to invest in a good line. If you are looking for a fluoro line which has similar to a nylon line, the Stren Fluorocast line is exactly what you need. Another special product created by Stren which offers you all the advantages of a good line. Undoubtedly, it deserves a place on the list as the best fluorocarbon fishing line. This is a new generation line which will help you with your casts. It is highly recommended for the beginner. High-Density Line: High density means that the line sinks faster than a mono line. It is helpful for topwater fishing techniques as the lure goes down quicker. Furthermore, many people say that this line improved their casts. Absorb Shocks: Literally, this feature increases the sensitivity levels. It is a major factor, and you will not find it in other lines. Strength: The chemical structure of the line is extremely special. There is nothing worse of losing a fish due to a weak line. Stren will not disappoint you. Whether you are a newbie or experienced fisherman, the knots will be hard as a tank. It would be a good idea to use high lbs. For big fish. Invisibility: 100% fluorocarbon line means that it does not only have a fluoro coating. We can ensure you that it will disappear in the water. Well, words are not enough to describe this product. If you try it, you will surely not regret it. The combination of low price and unique features makes it popular amongst the fishing community. First of all, you are not a real fisherman if you do not know Yo Zuri. It is a leading fishing tackle company. Yo Zuri H.D fluorocarbon line came to change the fishing philosophy completely. Invisibility is one of the company’s priority. You can use it both as a leader and main line. Almost invisible: If you enjoy fishing in clear waters, you should try this line. 100% fluorocarbon is exactly what you need. Moreover, we highly recommend it as leader line. High Test Level 30 Pounds: If you are fishing for big bass or other strong fish, you should try it. With 30 POUNDS test, you will not lose any fish or ruin your reel. Undoubtedly, if your line has a low test for instance 15, you will destroy the reel. Of course, the drag system will play a role, but the most important part here is the line. Diameter: 0.573 is the diameter of the line. Surprisingly the combination of pound test and thin diameter makes it ideal for leader lines. It may be thin, but its strength is unbelievable. Good Refraction in the water: Yo Zuri achieves low visibility because it absorbs the sunlight and adapts to any water environment. Finally, if you want to invest in a good fluoro line, this is a good choice. The best fluorocarbon fishing line has some specific features, and this line has almost all of them. The construction consists of high-quality fluorocarbon material which will be not visible in the water. The majority of anglers trust Yo Zuri because they test all their products before releasing them. Also, you will buy this line only once, because it will last a lifetime. First of all, are you interested in accurate and long casts? Are you facing high memory problems with your lines? If the answer is yes, this P line Floroclear line is created only for you! The company used one little secret to reduce memory. We will reveal this secret today! Keep reading. Great casts and low memory: Well, this thing definitely connects to each other. The line is silicone treated which minimizes the memory. Thus, you can cast your lure far away without any twists or loops. Fluorocarbon coating: The line is not 100% fluorocarbon, but it remains invisible in the water. Strong: It contains high-quality nylon under the fluorocarbon coating. So, there is no danger of sudden line breaks. Waterproof: If the line does not absorb water, the great characteristics remain unchanged! There is no doubt that if you are not fishing constantly and want a good cheap line, you should give it a try. With this “tool” in your tackle box, you will see that you will not use another line. After testing it, we highly recommend it as it is extremely strong. A smooth fishing experience is the main factor that you should take into consideration. The Sunline-Super-Sniper-Fluorocarbon-Fishing super FC SNIPER FLUOROCARBON line will enlighten your path. Equipped with triple resin coating, you will not have to put much effort while fishing. But the benefits do not end here. Please take a look below. Incredible Abrasion Resistance: If you are fishing in waters with rocky or weedy bottoms, you should have a line with high abrasion resistance. When you drag the lure through the water, it is very likely that it gets stuck in a rock. The Sunline-Super-Sniper-Fluorocarbon-Fishing fluorocarbon line will protect you from line breaks. Pure Fluorocarbon: It goes without saying that if the fish cannot see the line, it will bite. Nowadays, fish became more suspicious, so invisibility is a must when it comes to fishing. Triple Coating: This coating makes the line special. This is also the reason why we included this line in our list. It makes the line softer so you can handle it without problems. Finally, it is a very strong line both for bait casting and spinning reels. The pound test is also high, and the coating will make your casts easier. Comfort and accuracy in one line. However, the only drawback here is that it tangles easy, but if you look at the line, you will not have any problems. Summarizing, your fishing tackle is the first thing that you should choose wisely before you go fishing. There are many choices on the market, but they are not all good for you. Some manufacturers advertise some useless things and do not focus on the fishing purpose. Today, we tried to analyze some basic features, and we hope that they will help you. Just to sum up, the essential features of a fluorocarbon line are Invisibility, Strength, Abrasion Resistance, Pure Consistency and Density. Hopefully, our advice was helpful, and you will choose the best fluorocarbon fishing line.